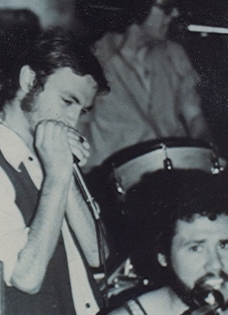 I've been playing harmonica & singing a bit since my youth. You've probably never heard or heard of the Sugar City Blues Band, The Zing Kings, Blue Blazes or several other anonymous groups I've played with in Crockett, Martinez & Sonoma County. You may have heard of the Bourgeois Blues Band which played around Sonoma County & beyond in the 1980s & 1990s. I was a member in the early '80s. The Ravens is an electric blues band. The Chicago blues of the 1950s & 1960s & especially that of the Chess Records artists is some of my favorite music. We love Muddy Waters, Little Walter, Howlin' Wolf Sonny Boy Williamson II et al and that Robert Johnson guy too. The Ravens features Stan Greenberg on guitar & vocals, Jeff Berger on drums, Larry Metz on bass, Steve Buck on keyboards, Henry White on harmonica & vocals, & sometimes we're joined by George Gittleman on guitar. Stan, Larry & Steve are also veterans of the Bourgeois Blues Band. The Rivereens is a jazz/blues/folk quartet featuring Steve Della Maggiora on guitar & vocals, Tracy Bigelow Grisman on stand-up bass & vocals, Candace English on violin & Henry White on harmonica & vocals. We love Django Reinhardt, Duke Ellington, Jimmy Rogers, Robert Johnson & all that jazz.